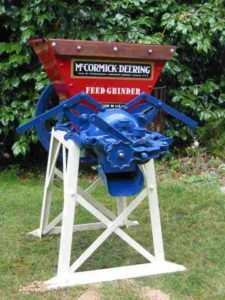 This was a lucky find, out of the local “Buy, Sell Swap” magazine that had a Feed Grinder advertised. It was off a pig farm and used to make meal for the stock. As luck would have it, it was IH. So the deal was done and it came home with me. Restoration required a complete strip down and clean plus the replacement of the hopper sides as these had all rusted away at the bottom. 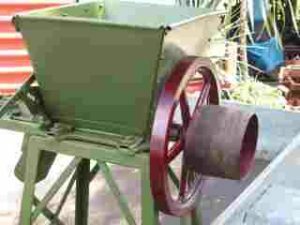 Its primary function was with crushing corn so the first part of the operation is an auger type system where the corn is crush into smaller pieces then feed through to where two plates which are adjustable crush or mill the feed even finer. After a few goes through the grinder you can get material to the consistency of cornmeal. I enjoy having this at rallies as a belt driven implement off one of my stationary engines. I pretty much crush whatever I can get my hands. Wheat, dried peas, corn. 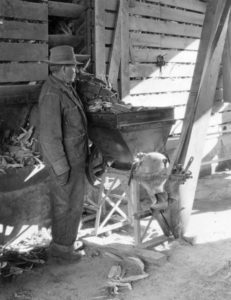 Whatever gets made is then used as chicken feed so nothing is wasted. The IH Feed Grinders came in different sizes and configurations.